One week ago today, I woke up to excruciating pain in my back and bladder area. I woke Aaron up and told him I needed to go to the emergency room. I had a suspicion I had kidney stones -- I'd never had them before, but had heard them described as the worst pain ever. Now, I HATE hospitals and have NEVER been to the emergency room, so that's an indication of how much pain I was in. We called my parents to come watch the kids and by the time they got there, the pain had subsided somewhat so we went to the Urgent Care facility instead of the emergency room. When we got there, I was tested for every single thing under the sun except kidney stones and was diagnosed with a bladder infection and sent home with some antibiotics. I felt much better in a couple of days so figured I just had a particularly bad bladder infection. Until Saturday. 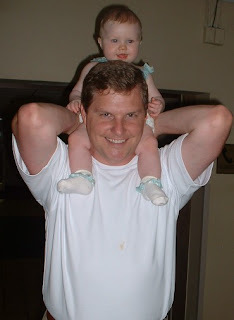 While eating dinner on Saturday, the familiar pain started to come back into my back and within hours I was writhing on the floor in pain, throwing up and generally feeling like death was imminent. So, once again, we called my parents to watch the kids and this time went straight to the emergency room. Given the obvious pain I was in they called me in quickly once we got there. They got me into a room, gave me wonderful painkillers and anti-nausea medication and did a kidney scan. In the words of the doctor on call in the E.R. "Yeah, you have a stone, a large one, 5 mm, and it's lodged. And you have lots of infection so we are admitting you because an infected kidney stone can cause serious consequences." Before I knew it, I was getting blood cultures done and being moved to a room. The doctor did surgery on Sunday morning to remove the stone and I got to come home yesterday afternoon (Monday). I am still in a good bit of pain (irritation from the removal surgery), but am thankful that the stone is gone and hopeful that I don't ever have to go through that again. Having been through labor once and two c-sections, I will say without a doubt, that a kidney stone is the most painful thing EVER!! Crisp weather and Halloween decorations in abundance signal that fall is here! To celebrate the season (which happens to be my FAVORITE), we loaded up the minivan and took the punkins to a local Pumpkin Patch. This was the first year of what we have decided will be a family tradition of visiting and letting the children each pick out a pumpkin. I must say we thoroughly enjoyed ourselves. Grace got to go on her first Pony Ride, Tyler enjoyed the rubber duck races, and Noah was the typical happy camper. Here are a few pics of the day.. . In my minivan post, I said I'd be introducing the stroller we love in a future post. Occasionally I write product reviews (because I find them sooo helpful when making my own purchase decisions), so I thought I'd just post my review here. We love our BOB!! We consider BOB part of the family! I had tried out this stroller while I was pregnant with my third child. 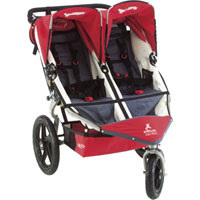 My second and third are 16 months apart and I do a lot of walking in addition to attending my oldest son's soccer games and needed a stroller that would handle well on various types of terrain (asphalt, gravel, grass). My husband balked at the price at first, but he is an engineer and once he tried one out, he was sold. He got a bonus from work and the stroller arrived 2 days after our son did! We walk a couple of miles as a family twice a day and we love this stroller. The kids are comfortable and the stroller pushes like a dream and we've tested it on about every surface you could use it on. The sun canopies provide great coverage as well as a barrier to protect my youngest from his feisty older sister when needed. The storage basket is large enough to tote all of our stuff and that is no small feat! We've taken it to the mall and other shopping centers and it easily fits through the doors. We bought the car seat adapter and it worked GREAT with our Graco Snugride while we were using it. The ONLY downside I can think of is that it IS bulky when folded up, but hey, that is the nature of a double stroller. I finally got my "Mommy Badge!" Years and years of being a soccer mom coupled with 2 children under 2 changes your way of thinking. Things that used to be uncool are suddenly the hottest thing going. Things like diaper bags and baby wraps and fancy strollers....and....MINIVANS!! Yep, it was inevitable and today it happened. We bought a minivan. And the scariest thing is that I LOVE IT!! I don't know why we didn't do this sooner! A little background...we have been driving a Toyota Highlander for several years. It HAS a third row seat, but I don't think it was ever intended to be used by anyone taller than 3 feet tall. Since Noah came along and two massive car seats took over the whole back seat, Tyler has been sitting in the tiny, tiny third row. He's been a good sport about it, but it's been painful for me to see him back there with his knees touching his ears. 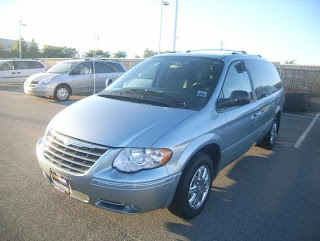 It's a 2005 Chrysler Town and Country with leather seats, Stow and Go 2nd and 3rd row seats (this feature is GREAT!! ), power doors, navigation system, and built-in DVD player (the kids have already tried this out and love it -- well, Tyler and Grace do...poor Noah still faces backwards so he'll miss out on that for a while). Because the thought of sitting with the kids in a car dealership throughout the buying process was a little too much for me, I charged Aaron with finding the perfect minivan for us and I am THRILLED with what he found. When I got in for my first ride, I really felt more like I was in a luxury car than a minivan. I can't believe we waited this long to make the switch! My sweet husband turned twenty-seventeen today!! I wanted to make a special post for this day to tell him how wonderful he is! First of all, he is the most incredible Daddy in the world. I know everyone says that about their husband, but he really is. We are blessed that his job allows him to be completely involved in our children's lives. He is so patient and involved with them and you can see the little ones just light up when he's around. He does his share of diapers, gives his share of baths, reads more than his share of books...he is the BEST! He puts his family first and helps guide us in the direction we need to go. Second, he is my very best friend. He's totally laid back and I'm a little more high strung so we balance each other out nicely. He's fun and we both like to laugh, which is sooo important as we go through this journey together. Third, not only is he a great husband...he's a great husband-chef! Many of you know that cooking is really not my thing. How fortunate for me to have found a mate who LOVES to cook! SCORE! After seeing video and still pictures of ourselves at the beach, we both decided to watch what we eat and exercise and I tell you, with Aaron creating healthy meals, it's been a breeze. Some days I go to the store and pick up lots of veggies that look good, bring them home, and he creates a wonderful meal. Yes, I am the luckiest girl in the world. I could go on and on with praise for my sweetie, but I have a feeling he's the only one who would read it. :) So, I will close by saying....Happy Birthday, Aaron!! I love you!! (and..na na na boo boo...you're older than me now!!) mwah! I'll be honest...I'm not a fan of the fair. I haven't been since Tyler was about 4 (at which point he started liking rides that made me queasy). But...this year I thought it might be fun to take all the kids for an afternoon adventure (I've heard too many horror stories about the things that happen out there at night!) Tyler was excited about going, but asked to take a friend since the rest of us are either too short (Grace and Noah), too old (Aaron) or too squeamish (me)to ride the rides he likes. I agreed to let him take a friend, which meant we needed to take two cars. I picked the boys up after school and met Aaron on the way into the parking lot where we were "robbed" on the way in. Don't worry, no guns involved or anything. This was totally legal robbery..$7 PER CAR to PARK! So since we had 2 cars, we're out $14 before we even get into the fairgrounds! Next, we go to the admissions gate...I forget how much it was for each person, but I know it cost us $23 to get in. Cha-ching..that's $37 down and we've just walked in the gate. Then of course you have to have tickets to ride. When you consider tickets are $1 each, each ride requires approximately 4 tickets, and we have two riders (Ty and his friend) with us....well...let's just say they didn't ride many rides!! I snagged 6 tickets from them so I could take Grace on her first merry-go-round ride. She LOVED it. As she was riding she hugged the horse's neck and as we went past Aaron she'd say "Bye Daddy" and then as we passed others she'd say "Bye People!" It was adorable! And just like that, I stopped putting a price tag on the day. When everyone was all out of tickets, we all went to see the animals and I was excited to get to see camels. I don't know why, but I've always been fascinated by camels. They are such cool looking animals. We ran into a particularly friendly one who loved Grace! Grace thought all of the animals were pretty cool...and I think Tyler and Tristan had a good time too. Noah was just along for the ride, but he was a happy camper! All in all, we had a fun, albeit incredibly expensive, afternoon! I was FINALLY able to get some pics of the kids TOGETHER!! Until recently, Grace has been unpredictable with Noah. She'd start out loving on him and end up scratching him. Now she LOVES to give him hugs and kissses. They are really starting to interact with one another and it is precious to watch! "NoNo's Nose" Sweet, Smiley Boy!